Compressible floor-covering materials that compress more than 1/32 inch (0.8 mm) when subjected to 50 pounds (23 kg) applied over 1 inch square (645 mm) of material and are greater than 1/8 inch (3 mm) in thickness in the uncompressed state shall not extend beneath walls, partitions or columns, which are fastened to the floor. R602.1.2 Structural glued laminated timbers. 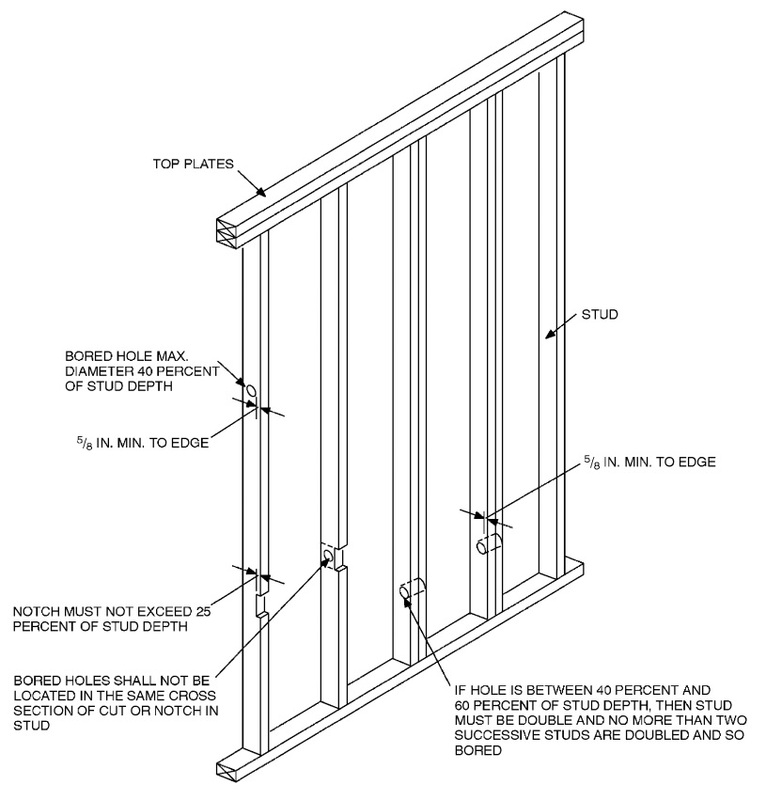 Exterior walls of wood-frame construction shall be designed and constructed in accordance with the provisions of this chapter and Figures R602.3(1) and R602.3(2) or in accordance with AF&PA's NDS. 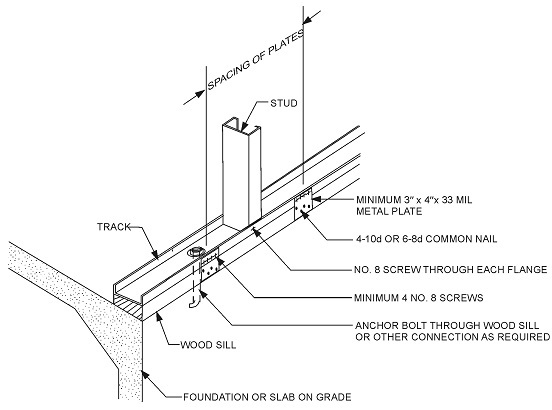 Components of exterior walls shall be fastened in accordance with Tables R602.3(1) through R602.3(4). 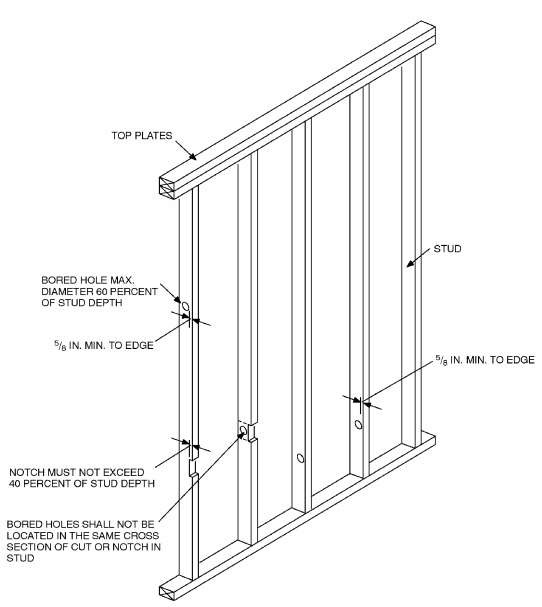 Wall sheathing shall be fastened directly to framing members and, when placed on the exterior side of an exterior wall, shall be capable of resisting the wind pressures listed in Table R301.2(2) adjusted for height and exposure using Table R301.2(3). 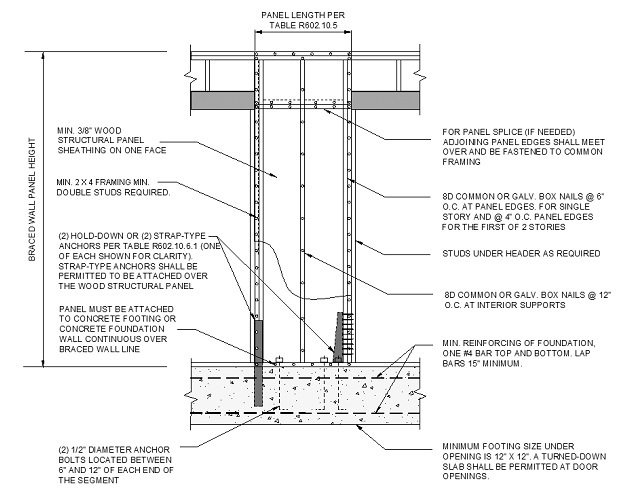 Wood structural panel sheathing used for exterior walls shall conform to DOC PS 1, DOC PS 2 or, when manufactured in Canada, CSA O437 or CSA O325. 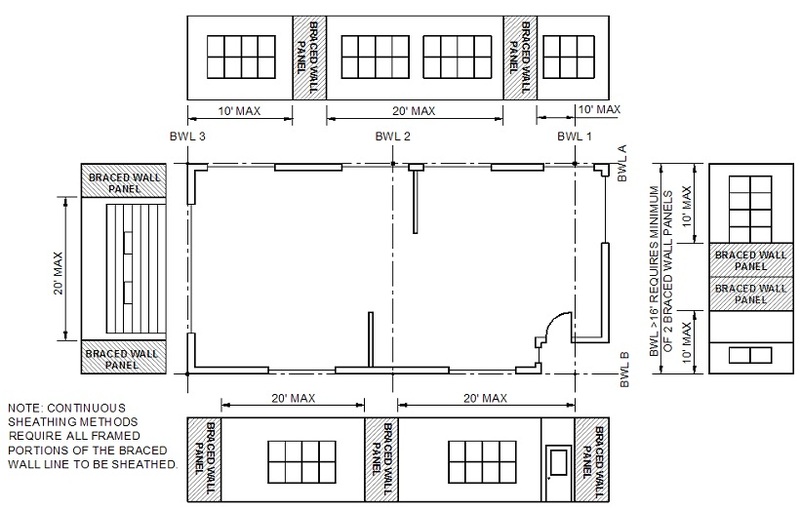 All panels shall be identified for grade, bond classification, and Performance Category by a grade mark or certificate of inspection issued by an approved agency and shall conform to the requirements of Table R602.3(3). 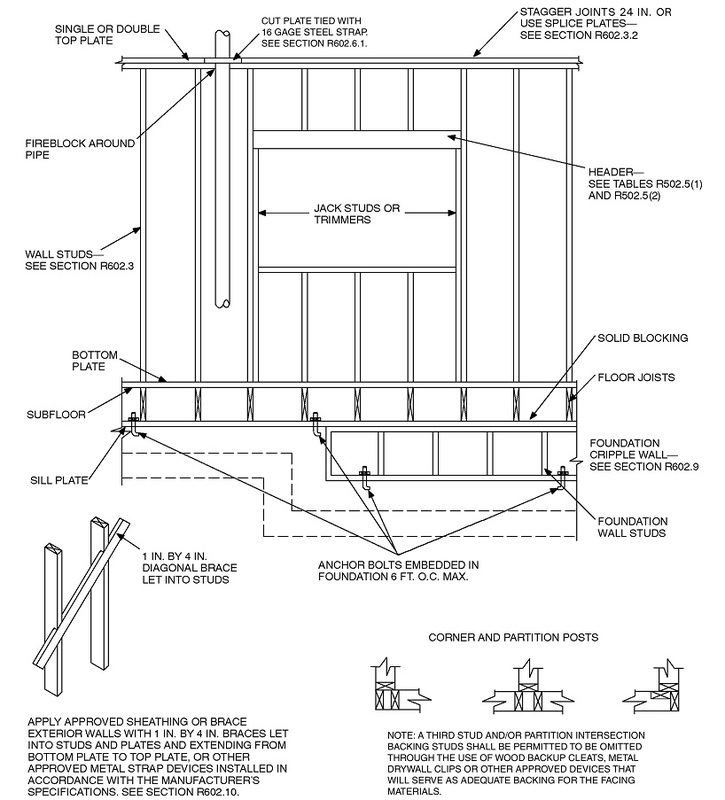 Wall sheathing used only for exterior wall covering purposes shall comply with Section R703. 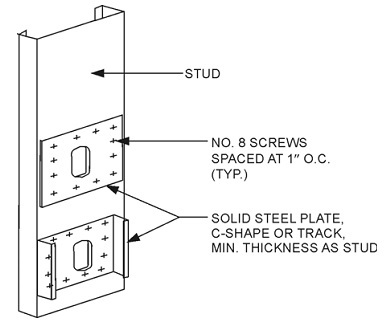 R602.3.1 Stud size, height and spacing. 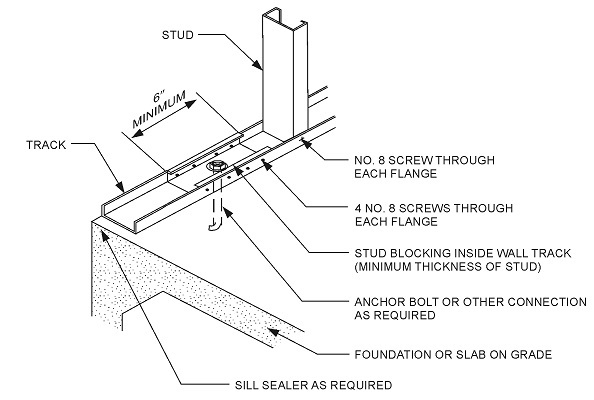 Studs shall have full bearing on a nominal 2-by (51 mm) or larger plate or sill having a width at least equal to the width of the studs. 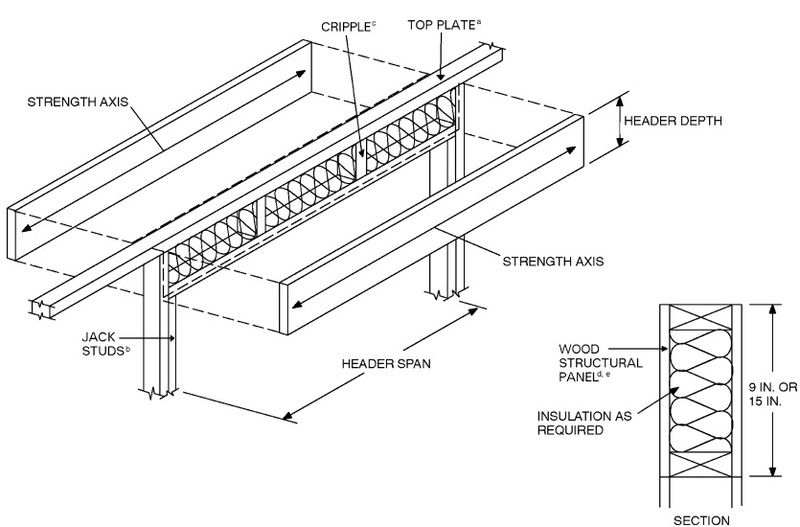 R602.3.5 Braced wall panel uplift load path. 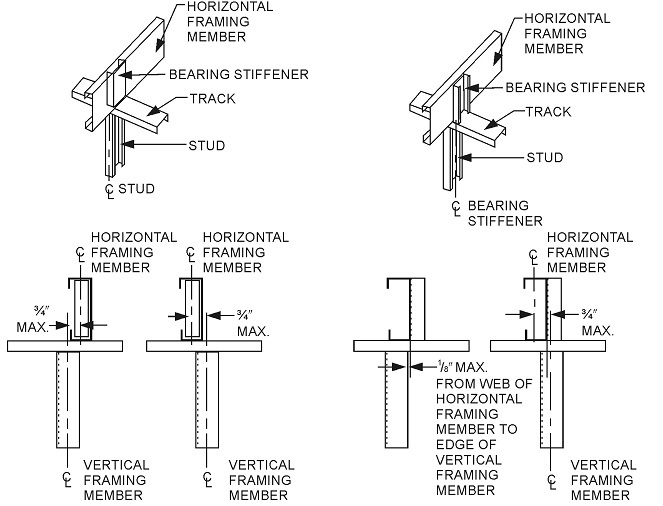 R602.6 Drilling and notching of studs. R602.6.1 Drilling and notching of top plate. R602.7.2 Wood structural panel box headers. 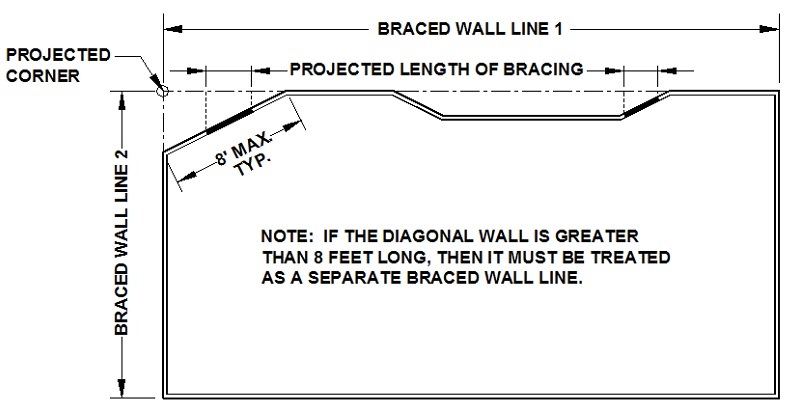 R602.10.1.1 Length of a braced wall line. R602.10.1.2 Offsets along a braced wall line. 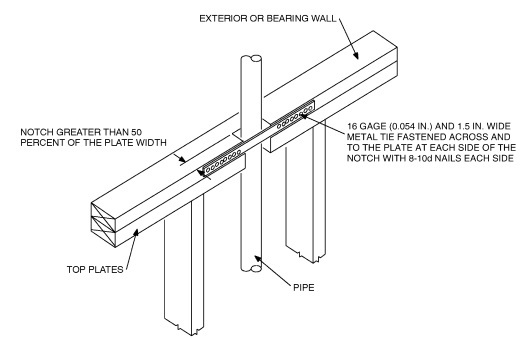 All exterior walls parallel to a braced wall line shall be offset not more than 4 feet (1219 mm) from the designated braced wall line location as shown Figure R602.10.1.1. 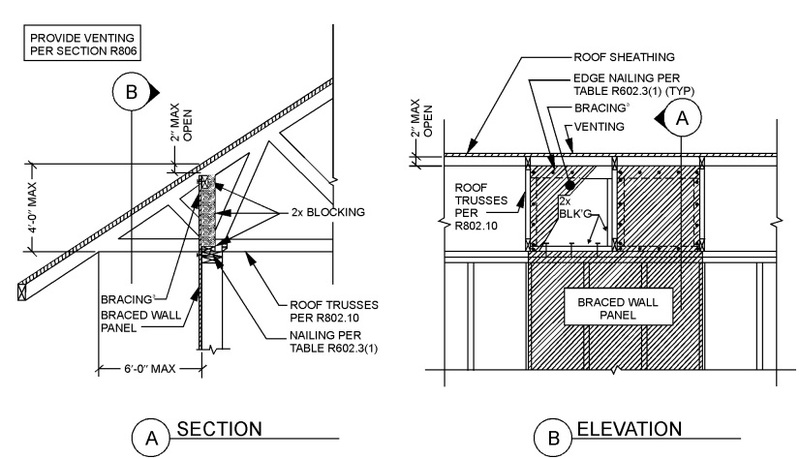 Interior walls used as bracing shall be offset not more than 4 feet (1219 mm) from a braced wall line through the interior of the building as shown in Figure R602.10.1.1. 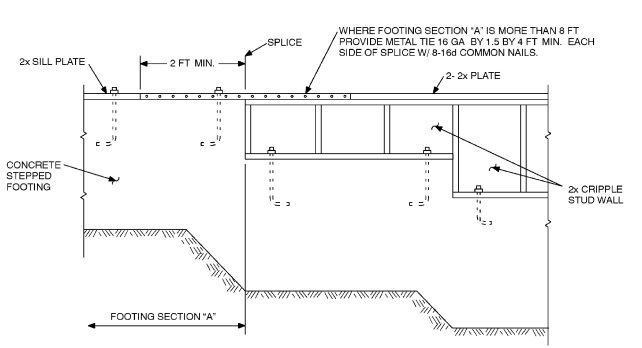 R602.10.1.3 Spacing of braced wall lines. R602.10.2.1 Braced wall panel uplift load path. 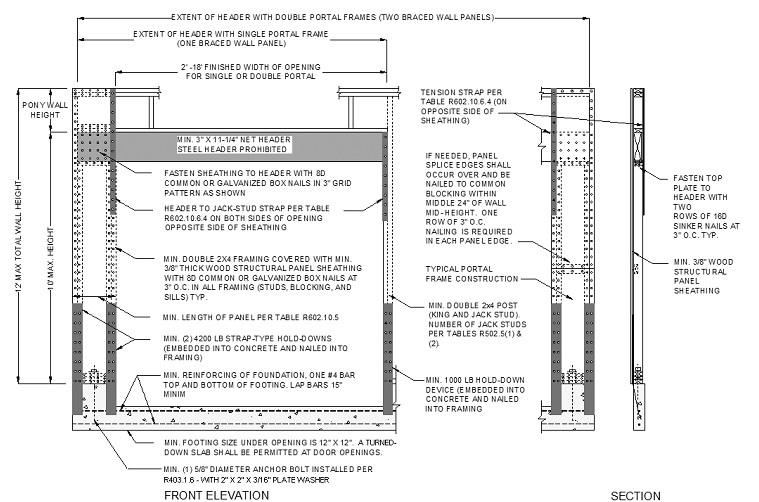 R602.10.2.2 Locations of braced wall panels. 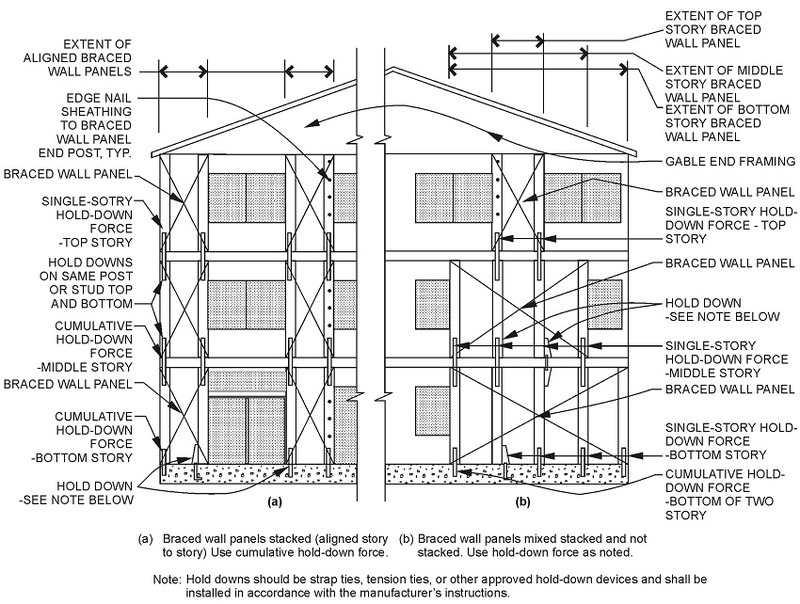 R602.10.2.2.1 Location of braced wall panels in Seismic Design Categories D0, D1 and D2. 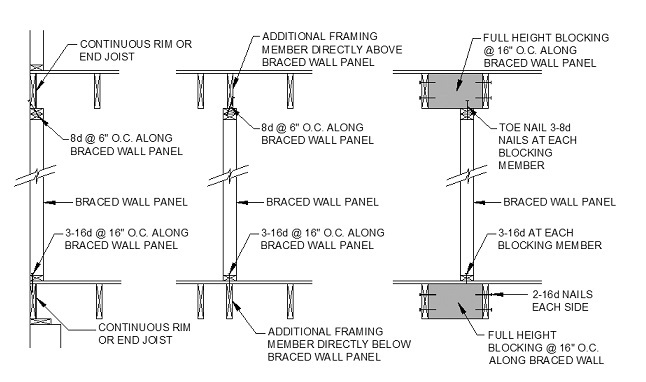 R602.10.2.3 Minimum number of braced wall panels. 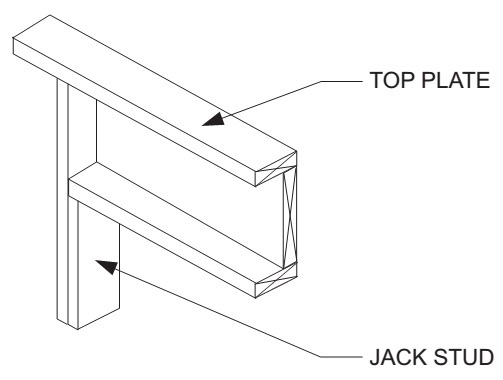 R602.10.3 Required length of bracing. 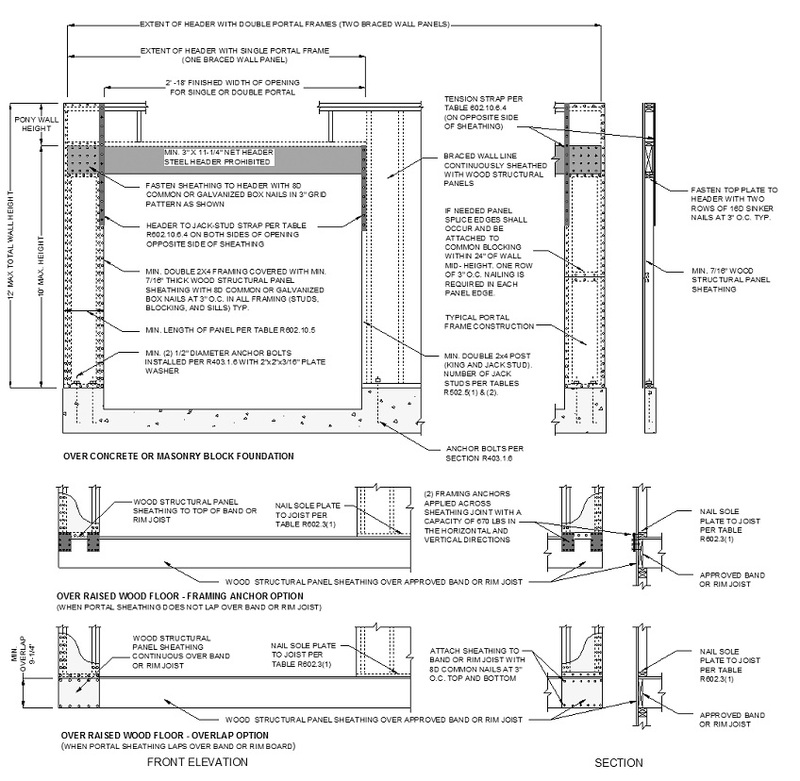 R602.10.4 Construction methods for braced wall panels. R602.10.4.3 Braced wall panel interior finish material. 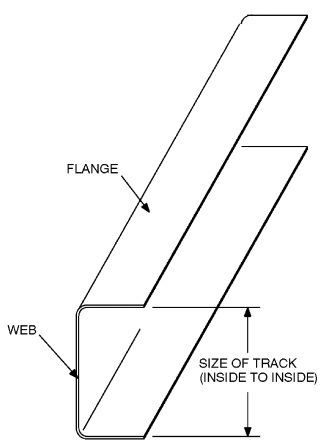 R602.10.5 Minimum length of a braced wall panel. R602.10.6 Construction of Methods ABW, PFH, PFG, CS-PF and BV-WSP. R602.10.6.1 Method ABW: Alternate braced wall panels. R602.10.6.2 Method PFH: Portal frame with hold-downs. 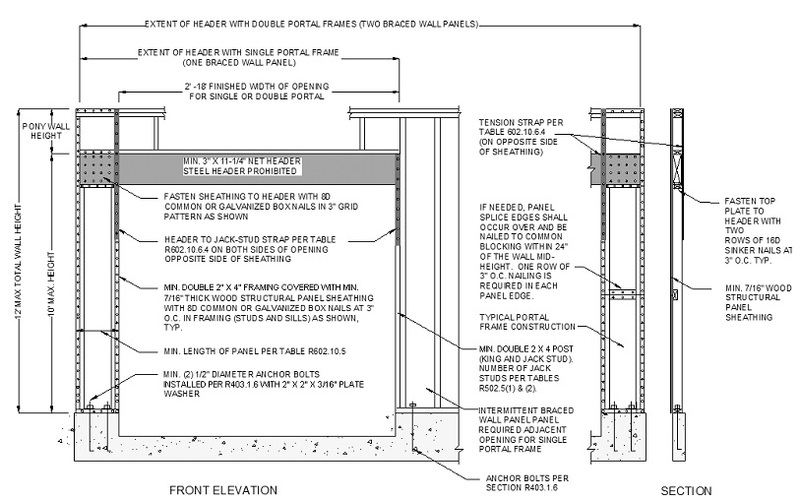 R602.10.6.3 Method PFG: Portal frame at garage door openings in Seismic Design Categories A, B and C.
R602.10.6.4 Method CS-PF: Continuously sheathed portal frame. 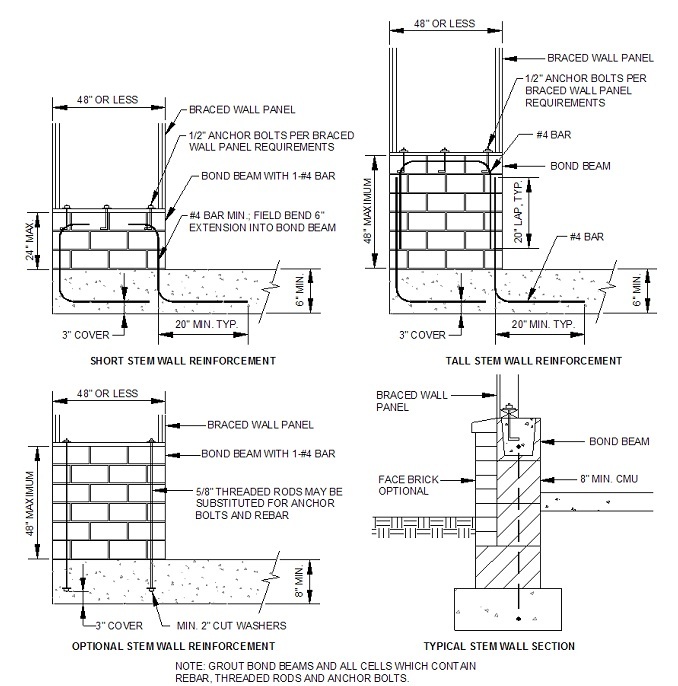 R602.10.6.5 Wall bracing for dwellings with stone and masonry veneer in Seismic Design Categories D0, D1 and D2. 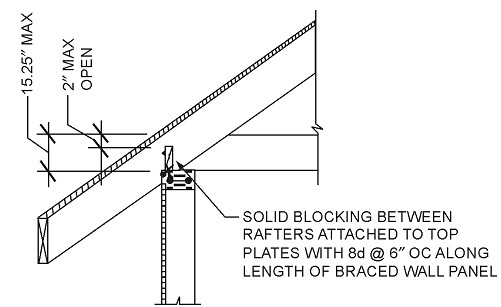 R602.10.7 Ends of braced wall lines with continuous sheathing. R602.10.8 Braced wall panel connections. 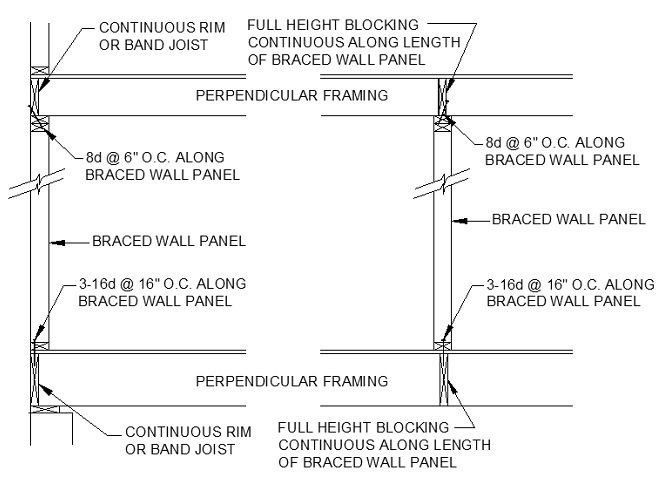 R602.10.8.1 Braced wall panel connections for Seismic Design Categories D0, D1 and D2. 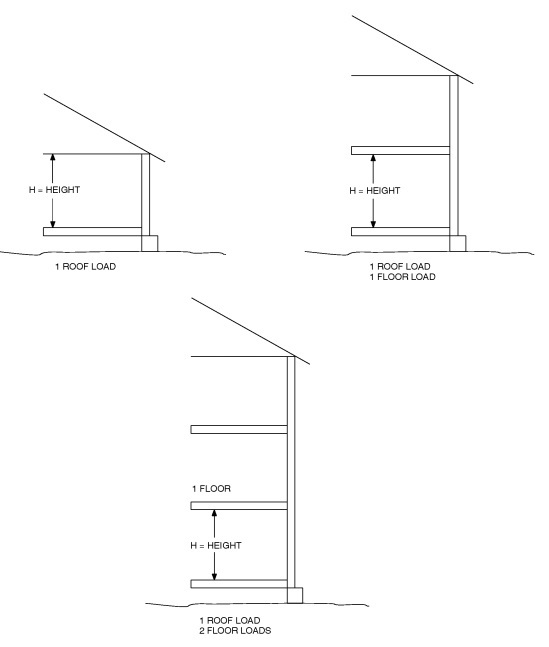 R602.10.8.2 Connections to roof framing. 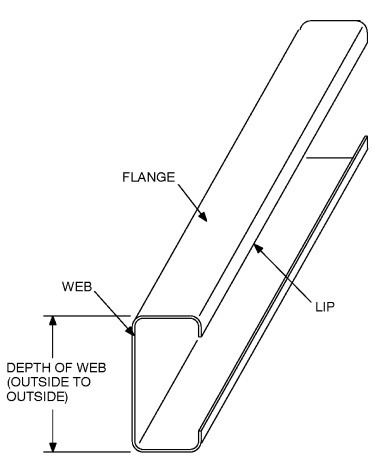 R602.10.9 Braced wall panel support. 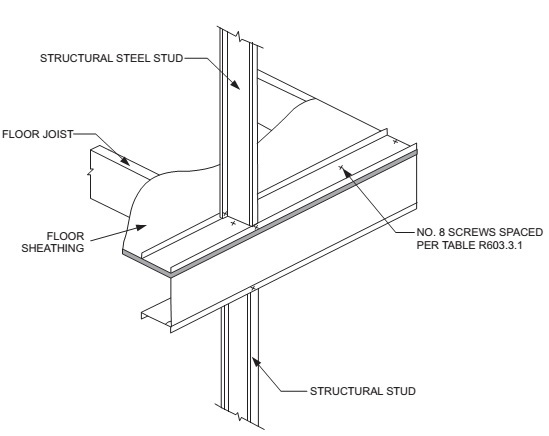 R602.10.9.1 Braced wall panel support for Seismic Design Category D2. 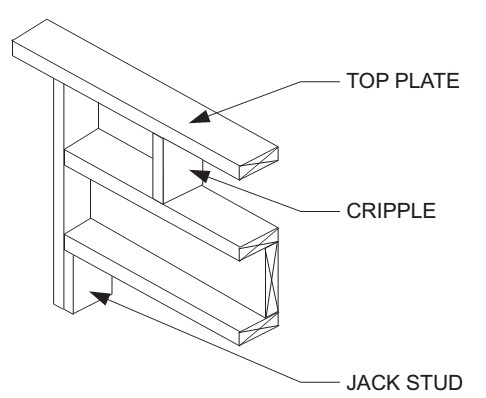 R602.10.11.1 Cripple wall bracing for Seismic Design Categories D0 and D1 and townhouses in Seismic Design Category C.
R602.10.11.2 Cripple wall bracing for Seismic Design Category D2. R602.10.11.3 Redesignation of cripple walls. 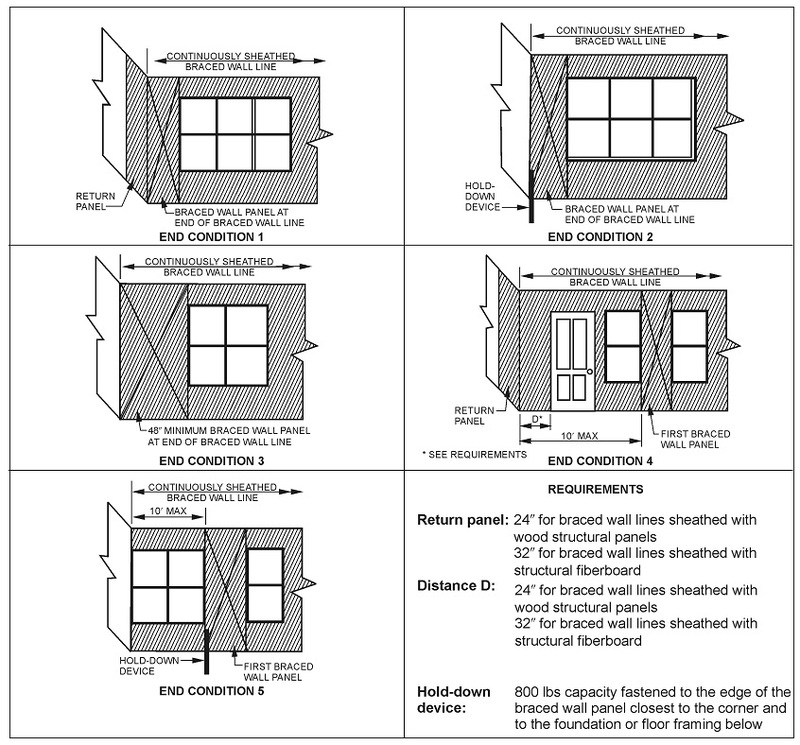 R602.11.1 Wall anchorage for all buildings in Seismic Design Categories D0, D1 and D2 and townhouses in Seismic Design Category C.
R602.11.2 Stepped foundations in Seismic Design Categories D0, D1 and D2. R602.12.4 Number of bracing units. R602.12.5 Distribution of bracing units. R602.12.6.3 Methods PFH and PFG. R603.2.5 Web holes, web hole reinforcing and web hole patching. 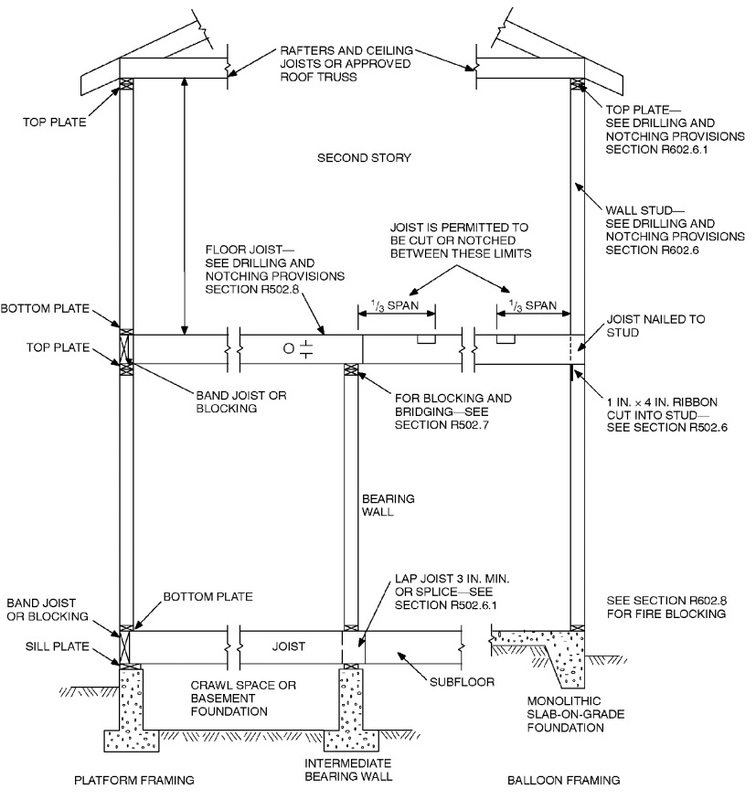 R603.3.1 Wall to foundation or floor connection. 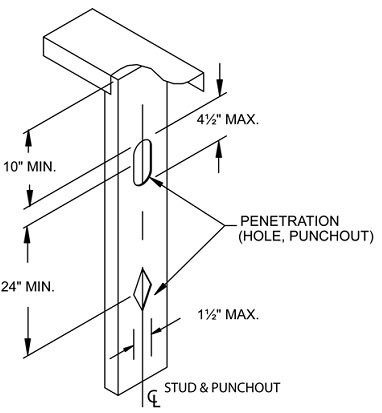 85 — 6′- 0″ o.c. 6′- 0″ o.c. 6′- 0″ o.c. 90 — 6′- 0″ o.c. 5′- 7″ o.c. 6′- 0″ o.c. 100 85 5′- 10″ o.c. 6′- 0″ o.c. 6′- 0″ o.c. 110 90 4′- 10″ o.c. 5′- 6″ o.c. 6′- 0″ o.c. — 100 4′- 1″ o.c. 6′- 0″ o.c. 6′- 0″ o.c. — 110 5′- 1″ o.c. 6′- 0″ o.c. 5′- 2″ o.c.